Can the Miss Universe Puerto Rico pageant bounce back? 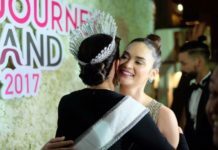 The series of misfortunes of Puerto Rican queens at Miss Universe seem to sway the opinion of the fans against their current national director Desiree Lowry. She is supposed to rescue Puerto Rico from Magali Febles but in all fairness to Magali, at least she produced a Miss Universe during her tenure. Desiree is yet to prove herself. Convincing the pageant crazy Puerto Ricans that Desiree is the answer to their woes is a tough sell akin to selling limber in Siberia at the height of winter. It has been three years in the running that Puerto Rican beauties failed to make the cut at Miss Universe and it is not for lack of talent or beauties. Puerto Rico is the home of beautiful women whose beauties are unique blend of Latina flair and American demeanor. The problem of Puerto Rico is both structural and organizational. Think about who decided to give Mariana Paola Vicente that horrendous gown back in 2010 which stopped her further advancement in the competition. Puerto Rico’s national organization seems to be run by people who are absolutely out of touch with what Miss Universe wants. It is apparent that they have a great difficulty in choosing the right beauty to send and then they would mess up in selecting the right gown for her. They also failed to train them properly and teach their beauties on how to shine effortlessly during the crucial stages of competition. One would like to think that Puerto Rico’s problem is about having a mentality stuck in the Trump era but the problems of the country dates back on that very era. Whoever will win the Miss Universe Puerto Rico crown hours from now, the challenge ahead is real and daunting. Desiree Lowry should rethink her approach and should hire the right people to help and advise her. Otherwise, Puerto Ricans would wish that Magali Febles did not really go away.